The wooded valley leading down to Aberfforest beach once hosted an amazing exhibition of sculptures. They were fashioned from soil and slate, turves and trees and were destined to return to nature in their own time and leave no trace. We watched them slowly decay over the years and now the sculptures are gone. I don’t remember the artist* but I do remember the delight and surprise of discerning a small plume of smoke drifting up from the chimney of this forest home when we first stumbled upon it. 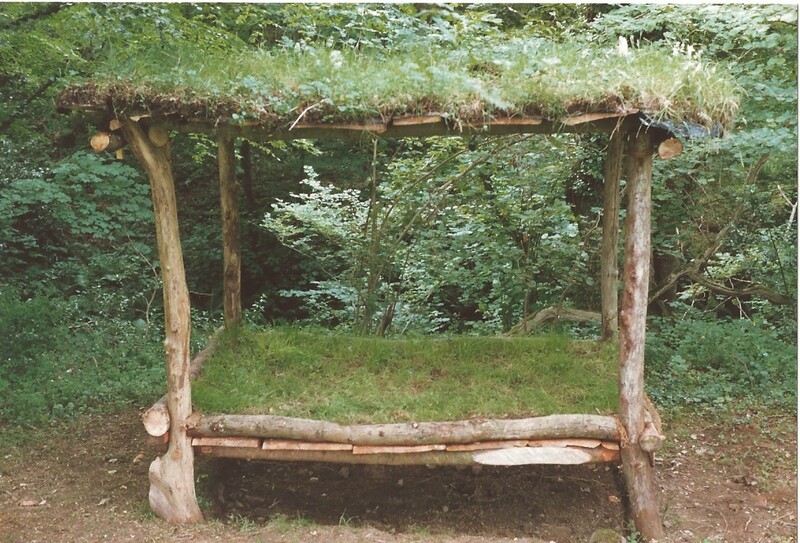 A four-poster bed offered shelter and rest. Sparkling rivulets were channelled from the streams through stone and wood appearing and disappearing, burbling and gurgling. I’m not sure whether even the most attentive walker could find any remnant of these installations now, but the wood is still a quiet, green hidden world where the wind chimes that drew attention to the sculptures are now silent, leaving you only birdsong and the sound of water falling into a pool below. 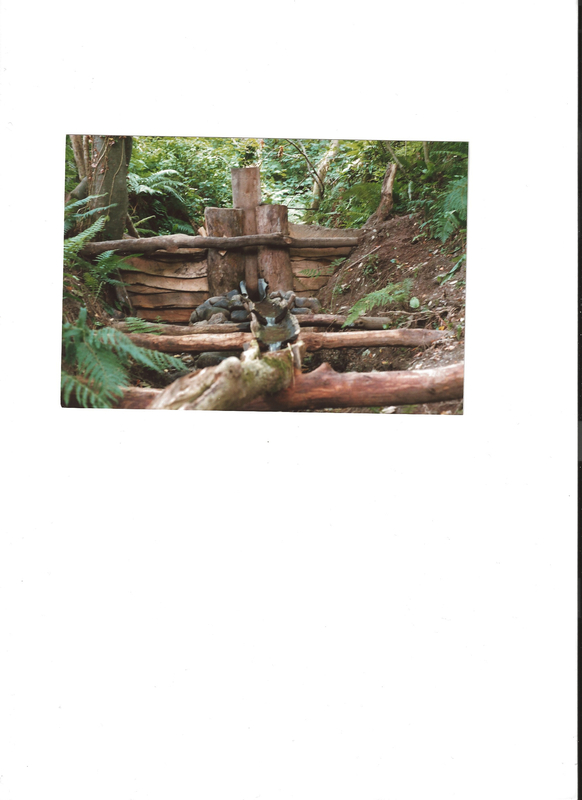 This beautiful wood forms part of the Dinas Community Forum walk that guides you from Cwm yr Eglwys to Aberfforest. Click here Cwm yr Eglwys to Aberfforest – Dinas Circular Walks – July 2014-2 to download. This leaflet and the others in the set can be found, free of charge, in local shops, pubs and B and Bs. They will also be at Tegfan, of course. *I’d really like to hear from anyone who knows more about this event and the artist who designed and constructed the exhibition. It was magical! 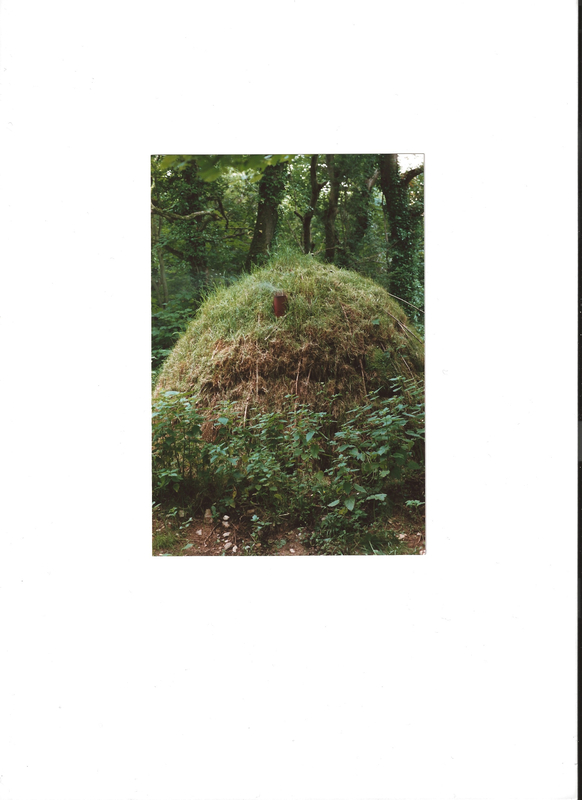 This entry was posted in Art, Crafts, Nature, Walking, Wildlife and tagged Aber Fforest, Coastal path, Dinas, Dinas Cross, sculpture, Tegfan, waterfall, woodland. Bookmark the permalink. Wish I’d been there in the late 80s to see them — magical, as you say! ah yess. these were truly magical when they were first “installed” I last walked that route about 10 years ago and it was difficult then to see them! In fact if I didnt know they existed I would have passed them by. the artist was “Walt” he still lives locally – I think he was responsible for a dolphin structure made out of woven twigs that appeared on the path at Newport estuary a few years ago. He also “famously” cut the CND symbol into the hillside above Pwllgwaelod in the 1980’s using a scythe. Thanks so much for that! Do you know his second name? I’d love to meet him and see more of what he does. I didn’t know about the CND in Pwllgwaelod. I’ll have to see if there’s a photo anywhere. You haven’t got one by any chance? He’s a very private person. He has no studio that I know of. If I see him I’ll ask – I do occasionally bump into him!. I doubt if a photo still exists – I remember being able to see it when you walked across the valley towards Pwllgwaelod and looked upwards .. of course it grew back after a while. I’ve also tried to find out who created the sculpture trail and was told fairly recently that the maker still lives in Newport . I can’t remember who told me but it might have been Len Rees, the potter in Dinas. It might be worth asking him. I’m pretty sure it was Len Rees, come to think of it. It was 2013, at his exhibition. His friend and fellow local artist Jean Pugh was there (she has since died) and they were reminiscing about when she lived at Dyffryn, the house that looks down into Cwm Fforest. I think that’s when I mentioned the sculpture trail. I can confirm that the Artist was ‘Walt’. He is indeed a very private individual. If you are interested I still have a program for the show , which was called ‘ Timber , turf and Time’ . I would love to see the programme. I did have it at the time, but sadly no longer. Can you scan it to me? I would like to add it to the blog. I’m looking forward to seeing it again. Thanks.